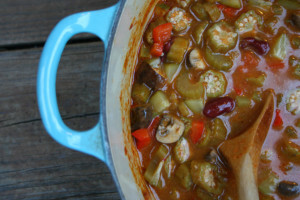 “Vegetarian Gumbo with Beans? !” – You may question. I did too … but my friend Justin Fox Burks insisted I give his recipe a try. Well … as usual … Justin’s recipe was some darn good stuff. His concoction of veggies and spices offers a tasty gumbo that had everyone at our table asking for seconds. Justin and his wife Amy Lawrence are co-authors of the fabulous vegetarian recipe blog “The Chubby Vegetarian.” Their blog has become my go-to for all things veggie. It is a great resource for dishes so delicious and creative that you will never miss the meat. This recipe is also featured in their new book “The Southern Vegetarian” (May 2013, Thomas Nelson Publishers). I was lucky enough to get an advance copy and am loving everything I have made so far. It’s a must for vegetarians and meat-eaters both! Back to the gumbo … Justin’s recipe calls for liquid smoke. An ingredient I had never used before. But since it was at Whole Foods I figured it was safe to eat! I used the Hickory smoke flavor. It gave the gumbo that depth that a smoked sausage adds a traditional gumbo. To make the roux, place the canola oil and the flour into a medium-sized dutch oven. (This is the pot in which you will eventually make the gumbo, so using it now saves on dishes later. A heavy pot like this is essential when making a roux because of its ability to distribute heat evenly.) With the oil and flour in the cold dutch oven, turn the heat on medium. Whisk the mixture constantly until you notice that it has become nutty (it’ll kind of smell like — gasp! — fried chicken) and fragrant (both of which happen about five minutes into the process). At this point, turn the heat to low. Keep a close eye on your roux, and whisk the mixture about every minute so no part of the roux burns. Continue in this fashion for about another twenty minutes or until the roux has taken on the color of an old penny. Remove the pot from the heat. Congratulations — you just made your first roux! Cooking Tip: If you like okra but are not a fan of the sliminess that sometimes can occur with it, sauté the sliced okra in batches in one tablespoon of canola oil until lightly browned. Add the cooked okra to the gumbo. Problem solved. Earlier this summer I was looking for new chicken dishes to try on the grill and I tried yakitori. These kebabs are a popular item on the menus of Japanese restaurants and are very simple to make at home. Yakitori is a traditional Japanese cooking method. In fact, it is one of the fastest and easiest grilling preparations there is. Your favorite chicken part is cut in small pieces (I prefer chicken thighs because the meat stays juicy and flavorful), skewered, and then lacquered with a sweet, syrupy sauce while grilled over direct heat. 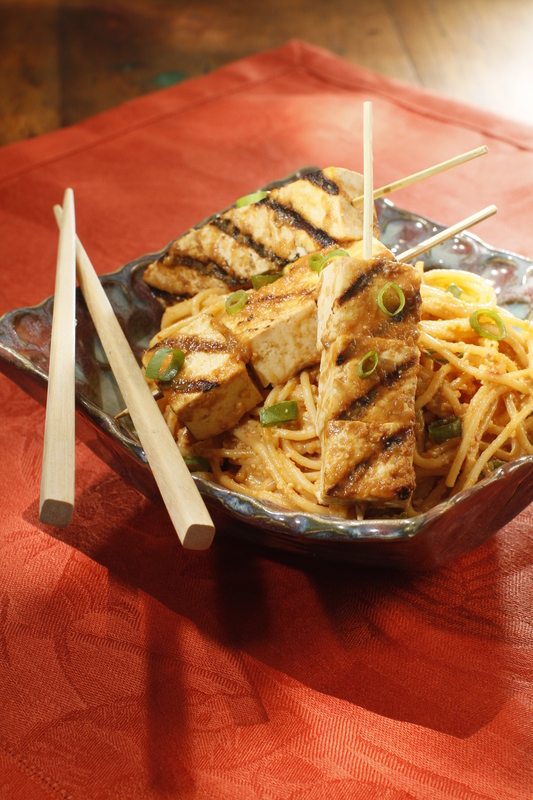 The emphasis on this dish is the sauce … which is both sweet and savory at the same time. It’s made from a combination of Asian ingredients such as soy sauce, mirin, sake, and fresh ginger. No need to worry about serving this to little ones. Most of the alcohol in the sake evaporates when the sauce is brought to a boil. But if you prefer, unseasoned rice wine vinegar can be substituted for the sake. To complete the meal, serve the skewers with a bowl of hot steamed rice and a crispy Asian slaw. In a medium saucepan combine the soy sauce, mirin, sake, ginger, garlic, and crushed red pepper flakes. Over high heat, bring the mixture to a boil. Reduce the heat to medium and simmer until the sauce has thickened slightly, about 8 minutes. Remove from the heat and let cool to room temperature. Put the chicken in a large bowl. Add 1/2 cup of the marinade and toss to coat. Cover, place in the refrigerator, and marinate for 30 minutes. Remove the chicken from the marinade and shake off the excess. Discard the marinade. Thread the chicken onto the skewers. Place the chicken on the grill. Close the lid and cook, basting with the remaining marinade and turning frequently to prevent scorching, until no longer pink the middle, about 3 to 5 minutes on each side. Cooking Tip: Mirin is sweetened rice cooking wine. It is found in the international section of most larger supermarkets. This quick and easy appetizer is sure to be favorite at your next party! If you have my cookbook Simply Salads, you may recognize the Peanut Sauce. 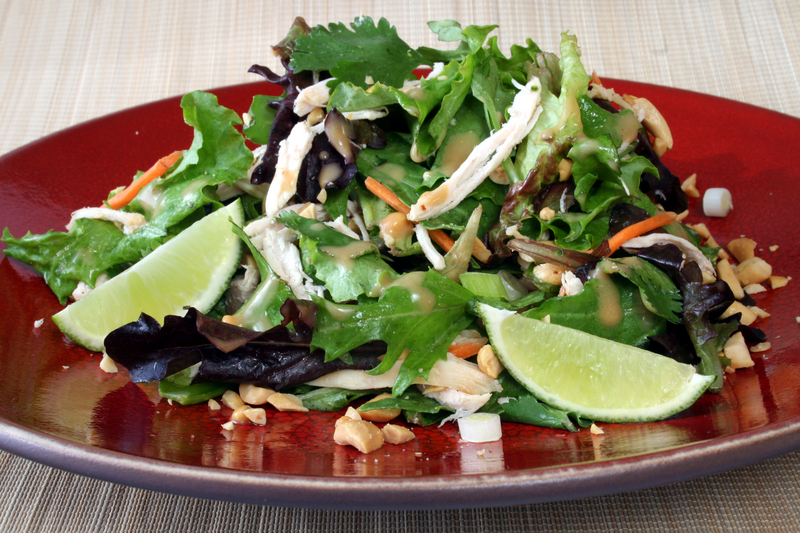 In Simply Salads, it is a dressing served with dishes such as my Chinese Chicken Salad and my Asian Noodle Salad. I always joke that it is so good that you will want to drink it! I have found that this yummy sauce made from Peanut Butter makes an equally delicious dipping sauce for satays (chicken or beef) or spring rolls. To prepare the Chicken Satays: In a shallow mixing bowl, combine the sesame oil, soy sauce, vegetable oil, garlic, ginger and red pepper flakes. Place the chicken strips in the marinade and gently toss until well coated. Cover and let the chicken marinate in the refrigerator for at up to 1 hour. To prepare the Peanut Sauce: In a small bowl whisk together the vinegar, peanut butter, ginger, soy sauce, honey, sesame oil, canola oil, and red pepper flakes. Season with salt and pepper to taste. Pour the sauce into a nice serving bowl and garnish with the chopped peanuts. To finish the Chicken Satays: Season the chicken with salt and pepper. Thread each chicken strip lengthwise onto a skewer. Place a grill pan over medium heat and brush it with oil to prevent the meat from sticking. 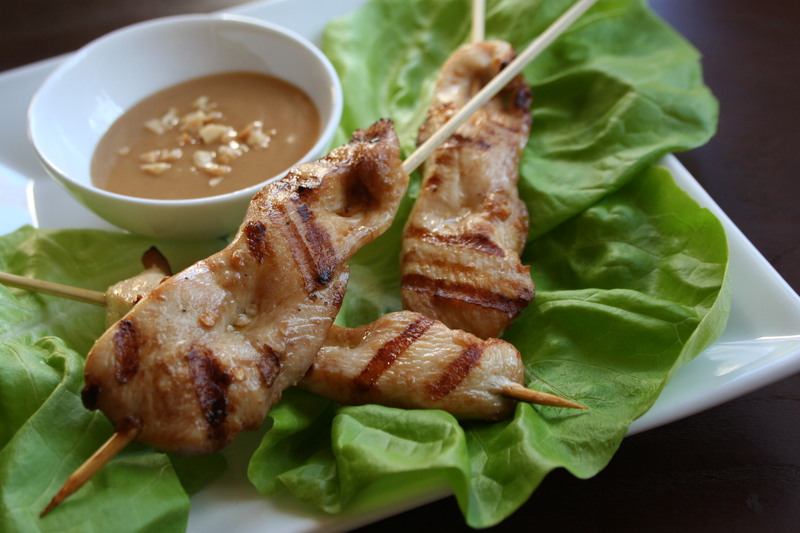 Grill the chicken satays for 3 to 5 minutes on each side, until nicely seared and cooked through. Serve the satays with a small bowl of peanut sauce on the side. 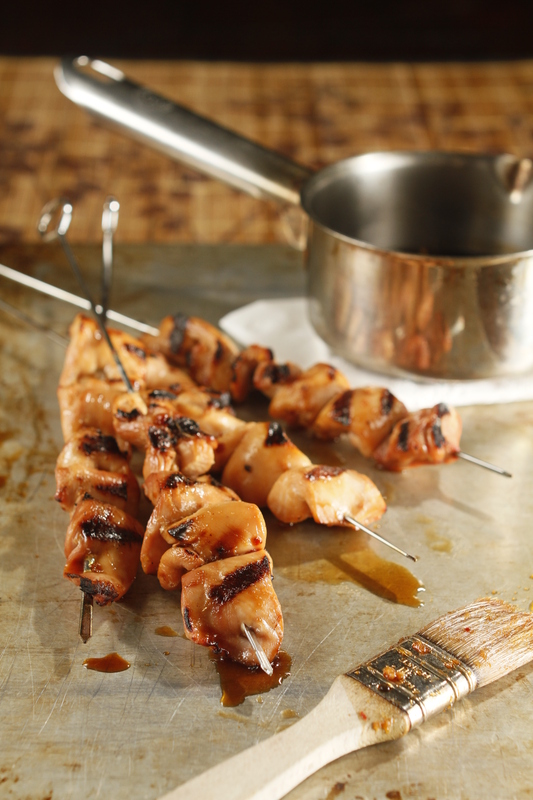 Be sure you soak your wooden skewers in water for at least 30 minutes prior to cooking to prevent burning. 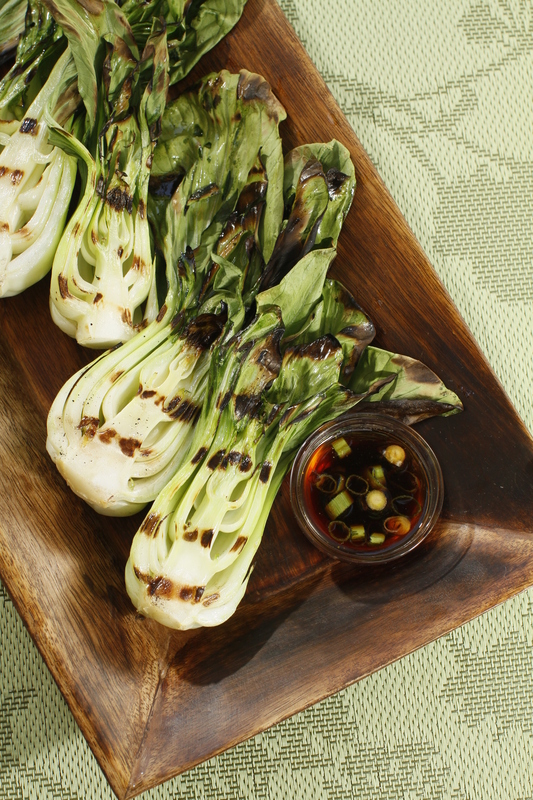 This dish can also be prepared on an outside grill.